This recipe of chocolate chip cake is extremely easy and fast to produce. My friend actually asked me one day whether I could make a quick and easy cake with melted chocolate in it, so I decided to take the base recipe of the Toscakaka, remove the almond crust and add chocolate chips instead. You can use this spongecake recipe as base for many cakes, including the Swedish midsummer strawberry cake, and adapt it to your taste with fruits, nuts, and chocolate. 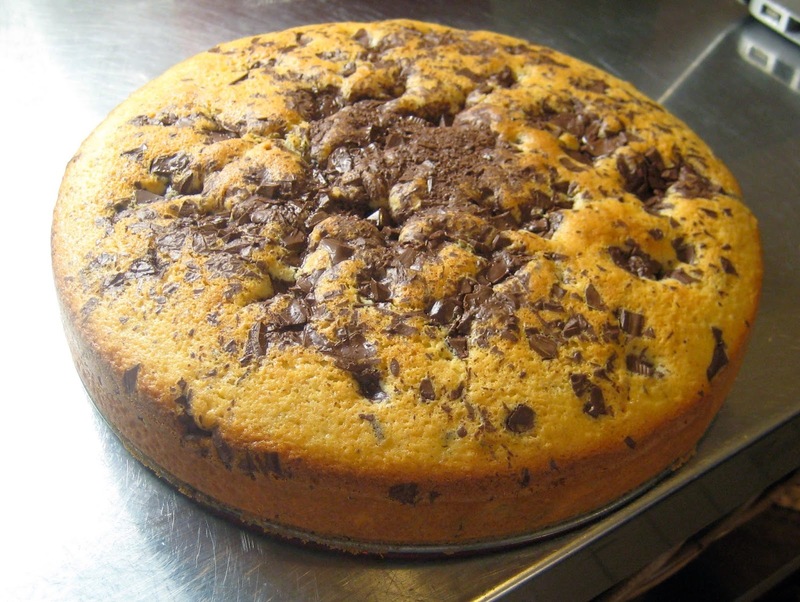 The chocolate chip cake is perfect for kids and grownups who are craving for some melted chocolate in a cake and I recommend eating it still warm... it is so good! Beat up the eggs and sugar until white. Melt the butter, add the milk and heat up to 37C. Mix the flour, baking powder and vanilla sugar. Mix all the ingredients together. Chop up the chocolate into chips and add half of it to the dough, mix. Transfer to a buttered and floured cake pan ans sprinkle the other half of chocolate chip on top of the cake. Bake approx. 25 min at 175C in the center of the oven.